Fetus Begins To Develop Immune System. 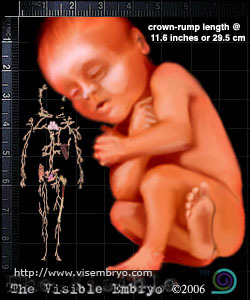 Fetal size: weight almost 4 pounds (1.8kg). Crown-to-rump length is over 11.6 inches (29cm), and total length is 18.9 inches (42cm). Mother's size: From the pubic symphysis to the top of the uterus measures about 12.8 inches (32cm). Measuring from your bellybutton to the top of the uterus now measures almost 5 inches (12cm). Eyes open during alert times and close during sleep. Eye color is usually blue, regardless of the permanent color as pigmentation is not fully developed. Final formation of eye pigmentation requires exposure to light and usually happens a few weeks after birth. The iris is colored and the pupil reflexes responding to light. Head hair grows thicker. Fetus begins to develop its own immune system. Fingernails reach over finger tips and fetus can scratch itself. White fat builds up underneath skin, making fetus appear lighter in color.